Getting hitched this season or have the piling party invites kept you guessing on what to wear? If gaudy or tacky has no space in your life, then this Kolkata-based designer label Surbhi Pansari is a must check to get your smart suave look on. The who's who of telly, Bolly and ramp (Karan Wahi to Prosenjit Chattopadhyay and Ravi Awana) have dressed in this label to look dapper, and this party season you an trust Surbhi to give you the eyeball grabbing look for the batch party or your best friend's wedding. Eclectic fusions with bold cuts, bright colours and retro hints of patterns and prints, Surbhi Pansari's newest collection has the urban man like you at the heart of its collection. Perfect the cocktail party look with a Italian monotone slim-fit suit (we are totally digging the sage green ensemble) and amp it up with a broach or a pop colour pocket square. 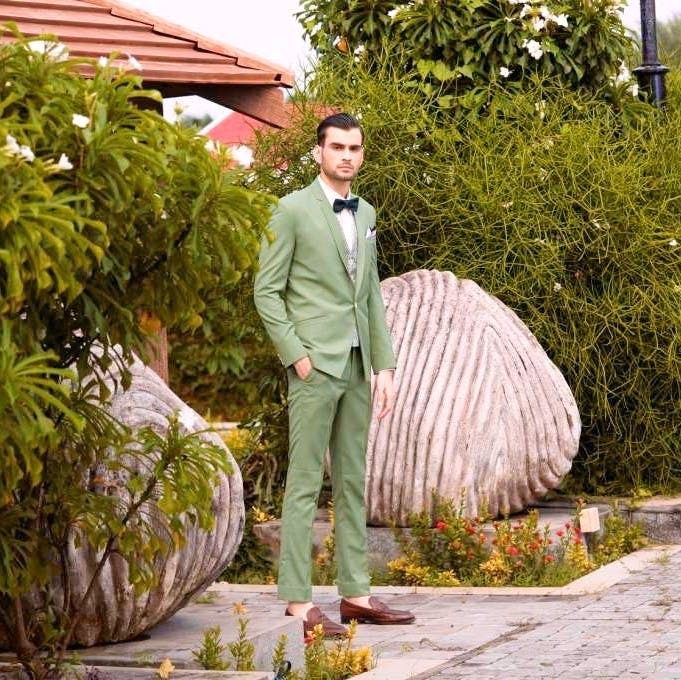 Grooms-to-be ditch the usual ivory tones and hop up on some bright colours like Montana blue, forest green and marmalade orange for your wedding sherwani. Team it up with Surbhi's hand-embroidered jootis and you'll have a celeb-worthy look to flaunt. Denims and prim shirts with blazers will definitely not cut the deal for fancy winter parties. Glam up these occasions with Surbhi's assymetrical cut bandhgalas (with retro checks), and (like she suggests) team it up with bright trousers and embroidered loafers. Way-too-much laid back guys, Surbhi's collection also has anti-crush wrinkle-free that you legit make you slog and worry less. Orders have to be given a minimum 45 days ahead to get your bespoke clothes on time. A set of basic shirt, trousers and bandhgala will set you back by INR 11,000. The wedding sherwani sets starts from INR 1.25 lakhs. Prices are definitely gonna bomb your bank, but when splurging in on the agenda then this is a perfect label to indulge in.